Construction is underway towards a dramatic transformation of Maggie Daley Park. 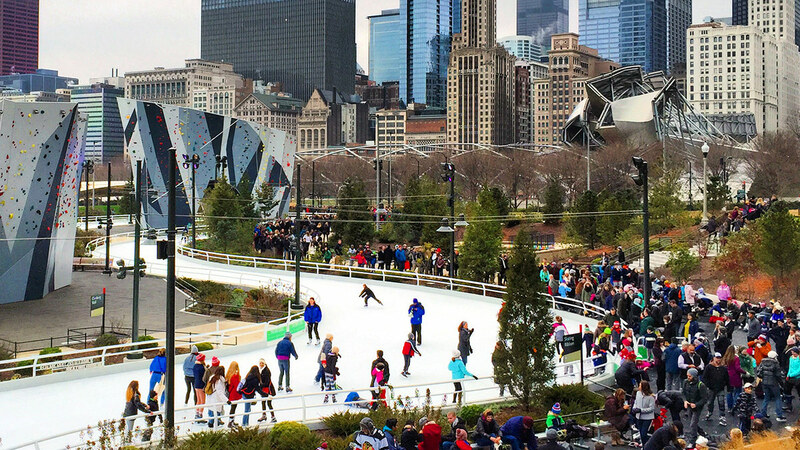 When complete, the new park will have a distinctive presence that will delight Chicagoans and visitors with signature elements like rock-climbing sculptures, an ice-skating ribbon, and play garden. Construction is well underway in Maggie Daley Park. Tree removal and tree salvage operation are completed for the project as well as the installation of the site erosion control measures and the removal of the playground. The removal and salvage of the existing light poles and fixtures continues. Tennis court removal and skating rink removal is also in progress in Daley Bicentennial. The topsoil removal in Peanut Park is complete and has begun in Daley Bicentennial. Approximately 8,000 cubic yards of topsoil has been stockpiled in Peanut Park to date. Following the completion of the topsoil removal, the subsoil will be removed in quadrants to expose the roof of the garage structure for repairs. Upcoming construction work planned for the next month includes the continued removal of the existing light poles, the removal of the tennis courts and skating rink as well as the continued topsoil removal from Daley Bicentennial to the staging area within Peanut Park. Company. Construction began mid-October 2012. Construction fence is installed around the perimeter of Daley Bicentennial and Peanut Park. Removal is in progress of the above-ground features such as benches, pavement, play equipment, trees and other site features. Soil removal will occur next in the construction sequence. The soil will be removed from above the roof of the garage parking structure and stored at Peanut Park for re-use. Once the soil removal is completed, concrete repairs to the garage and concrete foundations will begin for the new park elements like the play garden and rock climbing walls. At the completion of Phase I, the garage operator will waterproof the entire garage structure followed by the Park District beginning its second phase of construction. Phase II includes the full re-development of the park. Substantial completion for the entire project is anticipated in Winter 2014, with additional spring plantings in Spring 2015. The current layout of the northern edge of Grant Park suggests that it has the potential to provide a wide diversity of use, including active recreational areas, places for reflection and repose, and open, unstructured green space. But with the surrounding areas—and their open space needs—evolving rapidly, the park should evolve in turn. The Maggie Daley Park site is currently comprised of three distinct areas: Daley Bicentennial Plaza, Cancer Survivors Garden, and Peanut Park. The renovation will focus on Daley Bicentennial Plaza. It is a multi-use recreational facility that includes pathways and formal gardens, an outdoor skating rink, tennis courts, chess and checker tables, a miniature golf course, a playground, and a field house with locker rooms. It is situated on top of a 3,700-car underground parking facility, whose exposed vents and access points are integrated into the design of the plaza. The three original park sections were designed and developed independently, making the park site feel disjointed and compartmentalized. Sections of the park—especially the sunken passive space of Peanut Park—are currently underutilized, and the park does not fully take advantage of its potential for views and connectivity. In addition, the infrastructure that borders the site on several sides—including underneath it—has resulted in circulation patterns and microclimates that are less than optimal. North Grant Park’s landscape design will strive to address and improve all of these conditions in its new landscape design. Grant Park is as old as Chicago itself, and its history is one of civic vision, tenacity, and patience. Built and expanded over the course of more than a century, with input from some of the foremost American architects and urban planners, the park is a multifaceted testament to the eclectic spirit of Chicago. Aerial view from 1948 looking southwest over the former parking area that is now the site of Daley Bicentennial Plaza. In 1836, a strip of Chicago’s lakeshore between Madison Street and 11th Street was designated as park land, with a mandate that it remain “forever open, clear, and free of any buildings, or other obstructions whatever.” Without the funds to prevent devastating erosion on the site, in 1852 the city made a deal with the Illinois Central Railroad, allowing the company to erect a train trestle on the lake shore provided it also built a breakwater to protect the shoreline. A subsequent decades-long filling effort, which in part used charred debris from the Great Chicago Fire of 1871, built the shoreline out past the rail trestle into Lake Michigan, greatly expanding the open but largely unplanned area then known as Lake Park. In 1893, Chicago hosted the World’s Columbian Exposition. Lake Park was briefly considered as a site for the event, but ultimately only World’s Congresses Hall, used for meetings devoted to promoting an understanding between people of different cultures and religions, was constructed. Under the terms of the agreement, the Art Institute of Chicago took over the building at the conclusion of the Exposition. The Art Institute is now one of Chicago’s most popular attractions, and remains one of several exceptions to the “forever open, clear, and free” rule. In 1901, Lake Park was renamed Grant Park, in honor of U.S. President and Illinois native Ulysses S. Grant. Daniel Burnham and Edward Bennett’s larger 1909 Plan of Chicago proposed transforming Grant Park into a series of large-scale civic spaces, oriented axially and with a new natural history museum at their center. The planned buildings became the focal points of a legal battle led by Aaron Montgomery Ward over the site’s status as perpetually protected park land. Since the 1890s, Ward had been suing the City to keep circuses, barns, shacks, and other structures out of the park, and he eventually succeeded in forcing the Field Museum to relocate to a site just south of the park. With the museum moved, Bennett was chosen to provide a new design for the site. Construction of his Beaux-Arts-inspired park began in 1915. Replacing the museum as the centerpiece of the park was Buckingham Fountain, a 5-acre plaza featuring a fountain that is still one of the largest basin fountains in the world. Following the 1927 dedication of the fountain, construction slowed, and though additional improvements to the park were made in association with the 1933-34 World’s Fair, parts were left unfinished. The 28 acres north of Monroe Street and east of Columbus Street were used primarily as a rail yard and surface parking until 1953, when the Chicago Park District moved the parking lots to an underground facility on the site. In 1976, these below-grade lots were covered over by Daley Bicentennial Plaza, a multi-use recreational facility named in honor of longtime Chicago Mayor Richard J. Daley (1902-1976). In 1986, the reconfiguration of Lake Shore Drive opened up an additional 6.5 acres immediately to the east, which became a formal garden dedicated to cancer survivors and an open space nicknamed Peanut Park. In 1997, the city constructed a deck over a section of the sunken rail corridor in Grant Park to create Millennium Park, a modern center for music, art, and landscape design. Open since 2004, the park now features elaborate gardens, art exhibitions, performance venues, a winter ice rink, and a year-round restaurant, as well as serving as the setting for Cloud Gate and Crown Fountain, works of public art that have become instantly recognizable Chicago icons. After months of hard work, Maggie Daley Park is finally open to the public! The Ice Ribbon was officially opened on December 13 and has been a great success so far. Along with the Ice Ribbon, the majority of the Play Garden is open for use and the park pathways and picnic areas are ready for visitors. The site can now be accessed from Upper Randolph Street, the corner of Monroe Street and Columbus Drive, as well as from Millennium Park, via the BP Bridge. Over the winter months, construction crews will continue their work throughout the site, finishing details and completing those areas not yet ready for public access. The majority of the remaining work will take place in Peanut Park throughout winter and early spring. Once the ground has thawed, the remaining trees, shrubs, and perennials will be installed throughout the park. Check the Project Webcams to keep track of the daily activities on the site. Maggie Daley Park will transform the sites of Daley Bicentennial Plaza into a single continuous public landscape that will operate at a variety of scales, serve a growing residential community, and join Millennium Park as a new international destination on the Chicago lakefront. The emerging Lakeshore East neighborhoods have given the site a brand new local constituency, expanding the park’s role and purpose. Maggie Daley Park will work in concert with these initiatives to create a new world-class public landscape at a keystone location in the city. (Millennium Park, Buckingham Fountain, Museum Campus, the Art Institute of Chicago and Navy Pier are all within a short walk). Currently, the Maggie Daley Park site is comprised of three discrete landscapes, each with their own character. These three individual areas will be redesigned as a cohesive, continuous park that serves as a destination in its own right while also creating strong, universally accessible landscape connections on both the north-south and east-west axes. The primary goal of the creation of Maggie Daley Park is to develop park uses and landscape experiences that reflect the evolving open space needs of downtown Chicago. By establishing a network of park space that varies in scale and purpose, and that includes innovative play space, Maggie Daley Park will establish a distinctive presence that will significantly broaden the appeal and usefulness of Grant Park as a whole. Do you have a question about North Grant Park that is not listed in the FAQ? Would you like to voice your support, or air a concern? Please use the form below to have your say in the process. Where is “Maggie Daley Park”? The sections of Grant Park commonly known as Daley Bicentennial Plaza, Cancer Survivors Garden, and Peanut Park together make up “Maggie Daley Park”. Maggie Daley Park is bordered on the west by Columbus Drive, the north by Randolph Street, the south by Monroe Drive, and the east by Lake Shore Drive. It is connected to Millennium Park by the BP Bridge. The Chicago Park District’s goal for this project is to create a dynamic, sustainable, multi-functional park that reaches out to the local neighborhood as well as the larger Chicago community and tourist population. Why is it necessary to tear up the existing park? Daley Bicentennial Plaza sits on the roof of the underground Millennium Lakeside Garage (formerly known as East Monroe Garage) in Grant Park. The parking garage is in need of repair, requiring complete removal of the Plaza. The Park District is using this opportunity to take a fresh look at the design for all of Maggie Daley Park. Who will be designing the new park? The landscape architecture firm Michael Van Valkenburgh Associates, Inc. from Brooklyn, NY. What will the new park design look like? The park design and program will be determined through a design process that includes public input. To find out about opportunities to give public input, or to see the latest images of the park design, go to the “Look” section of the website. Will the new design include activities for all seasons? A goal of the project is to design the park to be attractive and engaging not only during summer, but also during the spring, fall, and winter seasons. Construction will begin in October 2012 with the current schedule projecting completion in Winter 2014 and some final plantings in Spring 2015.